With the view of fluttering colourful Buddhist prayer flags everywhere, Nepal is a mix of Himalayan views, golden temples, centuries old monasteries, hilly villages and wildlife reserves – all wrapped in one place. After a 20-minute flight from Kathmandu to Bharatpur that combines views of green landscapes with the Himalayan peaks in the backdrop, we landed in Bharatpur (centralsouthern Nepal). As our guide greeted us with a namaste and bowed a little to show respect, we didn’t feel like we were in a foreign land. To reach the lowlands of the Terai region, we drove through quiet passages of a village brightened by the yellow of mustard fields on either side. After around a 40-minute drive, we reached the boundaries of the Chitwan National Park. Covering an area of 932 square km, this former royal hunting preserve was listed as a UNESCO World Heritage Site in 1984 and is one of the last refuges for Asian single-horned rhinos and Bengal tigers. The safari began as a lovely drive in the wild, but soon turned out to be a real treasure hunt. It was the end of December and the early morning winter mist had surrounded us. We started following the footsteps of a tiger, which had supposedly crossed the path in front of us minutes earlier. Along with other visitors, we criss-crossed the forest in search of the threatened Bengal tiger, but instead saw a peacock and a tiny black wild boar. In winters, vegetation in the forest is denser, which made it more difficult to spot the animals. Soon, the Sun broke through the branches of the huge Sal trees that make up 70 pc of the forest and whose leaves are traditionally used as plates by the people here. Compensating for the disappointment of not being able to witness the big cat, a single-horned rhinoceros surprised us with his sudden appearance from the tall green grass. We held our breath in front of the animal, which is reputedly dangerous, and it nibbled on the grass, letting us enjoy the sight. Besides the fauna, we also discovered the rich vegetation that surrounded us: silk-cotton trees – whose branches are the favourite resting place for leopards, elephant grass that is a favourite meal of the rhinoceros, the invasive Mikania micrantha – locally called bandmara (forest killer), and also many edible berries including gooseberries, and other plants. Of the several ways to discover the richness of the region, a soothing boat trip on the Rapti River is an ideal opportunity. The national park has over 350 different species of birds, including birds of prey, herons, sparrows, shrikes, kingfishers, and more. Sailing along the water, we passed near the marshes with crocodiles – some of them were swimming in the river, while others were sunbathing on the banks. Strolling near them were Gray Crabbers and majestic egrets with the sunset giving hues of pink and orange to both the sky and the river. Leaving the forest, as we headed towards the adjacent village, we saw unfenced houses built from earth and bamboo; decorated with hand-painted patterns. Under the roof were hanging corns left there to dry to be better preserved. “This is a typical Tharu architecture. The designs are rooted in devotional activities and are passed on from one generation to the next, occasionally introducing contemporary elements,” Mahesh Gurung, a naturalist who was also our guide, told us. The Tharu and the Darai communities in Nepal are among the most important ethnic groups in the region. “Tharu people prefer to stay close to the nature. 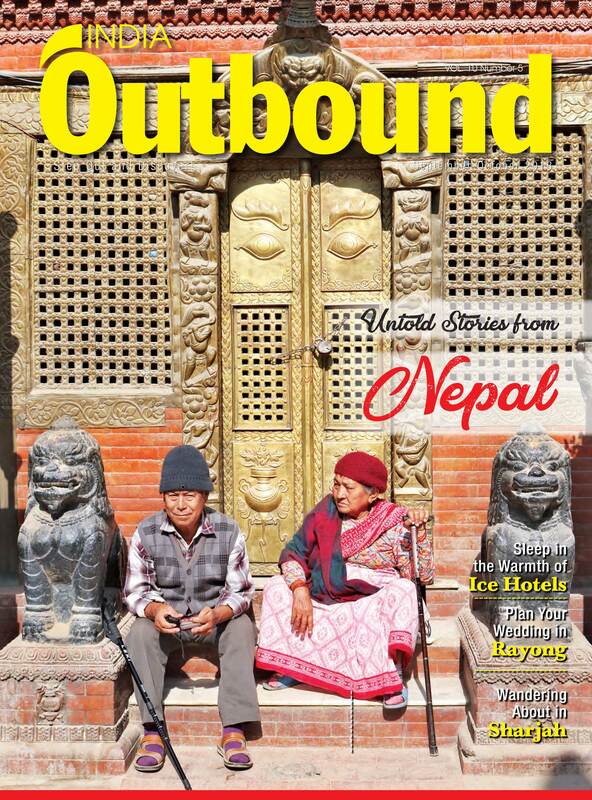 Even their gods comprise a large number of deities that live in the forest – including some trees and river streams,” said Gurung as he showed us a stone idol that was established on the way to the forest. “We have been carrying forward the traditions of farming and shifting cultivation,” said Suha, a 55-year-old farmer, who also accompanied us as we explored his village. Suha and his wife invited us to their house to share a bowl of chhang – the traditional white rice wine, which the Nepalese and Tibetans consume by brewing a mix of rice, millet and barley. A little later, another bowl of the drink was accompanied by a meal, served by young women wearing traditional red outfits. The platter consisted of Tharu specialties – a fish curry, seasonal vegetables, sticky rice, and small freshwater snails cooked in a spicy sauce, locally called ghunghis. Ghunghis are collected from nearby water bodies, which are left overnight to get rid of all the gooey material inside them. They are later cooked with coriander, chilies, garlic and onions. Eating them is tricky for first timers – simply try sucking the snail out of its shell, which has 80 pc of its mouth closed. If you wish to understand the community better, hotels and lodges in the area provide special Tharu home visits and stays. The lodges also have a setup where guests can cook with locals, followed by a cultural program wherein the Tharu males use dholak (drum), latthi (stick), and thekara (stick dance), to sing and dance. This folk dance is especially performed during the Faguwa festival (Festival of Colours). 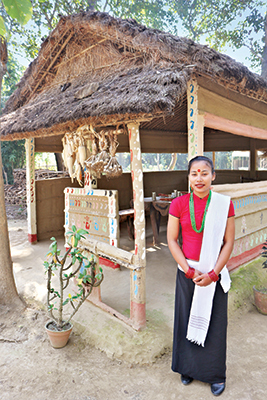 The Tharu culture is so wide that there’s a Tharu Cultural Museum in the village displaying ornaments and rakshi (traditional Nepali distilled alcoholic beverage) distillery utensils. 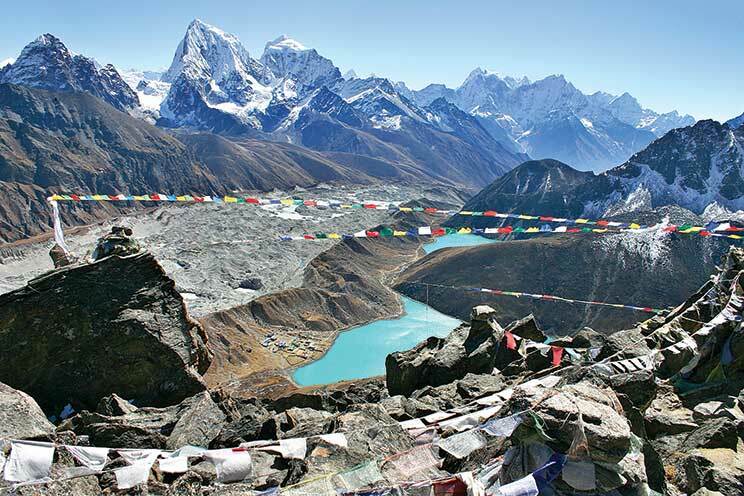 Besides its rich heritage and culture, Nepal is best known for the Himalayas and the wide variety of adventure activities, including trekking and mountaineering that the entire country offers. Here in Nepal, you can trek for days, take a break in cosy lodges and even homestays and at the end of your day, have desserts at one of the highest bakeries in the world. As we began our trek from the rocky slopes of Dunai in Dolpo (west Nepal) amidst green fields, after covering a little distance we saw yak caravans crossing the Himalayan passes. We also walked through several villages and flat valleys – one of them was the Dho Tarap village with one of the highest settlements in the world where you can also choose to experience a homestay. We further criss-crossed by the Numa La Base Camp and Yak kharka and soon were amidst the clouds. However, the best part of the trek was the Phoksundo Lake – the deepest lake in the country, with its turquoise green waters reflecting the clouds that moved above it. Here, you can choose to have a meal by the waters surrounded by cool breeze and mountain views. Dolpo is a restricted area and so trekking permits from the Department of Immigration and a Trekkers’ Information Management Systems (TIMS) card are needed for trekking here. Apart from the fee, getting a TIMS also requires passport copy and passport size photographs. Another place to trek a little differently is at the Annapurna Circuit where you walk anticlockwise and thus it is easier and safer. Here you can choose from the three-week long Annapurna Circuit, which stretches into the Mustang region, to short three-day treks. The Annapurna Circuit includes Annapurna I – first of the 8,000m peaks to be climbed, and another 8,000m giant – Dhaulagiri, which is located west of Annapurna I. Between these two mountains lies the valley of the Kali-Gandaki River – the deepest gorge in the world, falling nearly 5600m below the summit of the Annapurna I. On the way, you will come across long stretches of unexplored forests and also a mix of many ethnic communities. Another place to head for adventure seekers, even if they are not mountaineers, is the South Base Camp of Mount Everest, at an altitude of around 5,364 metres. You can fly from Kathmandu to Lukla (town in the Solukhumbu District, north-eastern Nepal) and start your trek from there, or trek up to Lukla as well. From Lukla, trek upwards to the Sherpa capital of Namche Bazaar and onwards to the Dudh Kosi River. From here, it takes another six days to reach the Everest Base Camp. There are numerous designated shelters enroute for the trekkers to take a break. 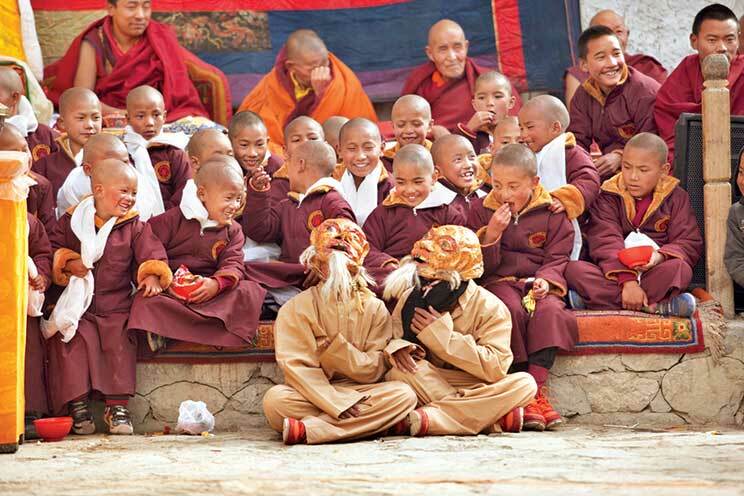 Aside from breathtaking scenery, travellers to the region can also experience unique Sherpa culture by visiting monasteries and museums along the way. Do experience rolling the colourful prayer wheels. Here is the catch – start from left and move towards right. According to local traditions, once you start rolling your hands over these wheels, you can only stop once you are done rolling all of them. At the base camp, it is compulsory to hire a guide as some lone trekkers disappeared from here in the past. A guide for a day costs between INR 800- 1,500 and will tell you plenty about the local culture and natural environment throughout the way. You can book before you go, though you will pay less by booking in Kathmandu – just ensure they are registered with the Trekking Agencies Association of Nepal (TAAN). While trekking to the base camp, pack lightly but efficiently, as the Himalayas are cold above 3,000m any time of the year. Carry a first aid kit with medications for diarrhoea, chest or sinus infection, and bandages. If you can’t spend too much, carry some essentials, as it gets expensive as you keep climbing up. For instance, expect to pay around INR 800 for a slice of cake from the highest bakery in the world at 4,950 metres in Lobuche. Coming down to the plains to better understand Buddhist monasteries, we headed to Itumbahal in the Kathmandu Valley. Hidden in the narrow chaotic lanes of old Kathmandu, Itumbahal (bahal translates to a Buddhist monastery courtyard) is one of the biggest courtyards in the city. Taking a few steps inside the main entrance, we stood facing a huge wake-up alarm bell for the entire neighbourhood. The place is a living example how the community in the town has changed over the past two decades – farmlands got converted into apartment complexes and it is now difficult to find local farmers drying their grains in Itumbahal. As we looked around, we spotted old shops selling traditional herbs and spices. These little stores are the last remaining samples of the ageold traditions practiced by the Nepali baniyas (a community of merchants, dealers in grains or spices, bankers and money-lenders). As we walked further, one of the first things that caught our attention was the Manjushree temple. Manjushree is one of the most important deities in Buddhism. “When I was a kid, I had a terrible pain in my ear that did not go away despite antibiotics. It was then when a priest made me go around the Manjushree temple three times, came close to my ear and said some mantras (chants). I still can’t explain how I felt, but the pain had vanished,” recalls Robin D’costa, who had spent his childhood in the courtyard. The place is full of stupas and temples, all of which have a different belief associated with them. One of them is the White Tara temple (also called the Docking Tara) – a symbol of longevity, compassion and healing. Just adjacent to the temple, on the left, is a red brick wall structure that houses a well. The enclosure is believed to host the Nayagas (snake deities) and thus the water inside the well is believed to have healing powers. Interestingly, apart from the temples, for a courtyard to qualify as a monastery, there needs to be an astrologer who resides in the courtyard. Using the passage behind the temple, we reached another square that houses a third generation local astrologer. A board hanging outside his house announced that appointments could be fixed between 8-11 am everyday. Rajamati, a Nepalese legendary beauty, had also lived here some 200 years ago. Hidden in a tiny square, her light yellow coloured house was renovated after the massive earthquake of 1934, and lost its old architecture. A lot of tourists take selfies in front of the house because Rajamati’s song is a traditional Newari ballad. After exploring Itumbahal, we headed towards the Basantapur Durbar Square, which is a 10-minute walk. On our way, we came across a beautiful alley lined with shops selling dream catchers and even raw materials to make them ourselves. We quickly grabbed one each for ourselves and proceeded towards the Durbar (Palace) Square. Two stone lions stand to guard the entrance to the square. In Nepal, these lions outside a building indicate the importance of the place. Durbar literally translates to a palace, and this was where the city’s kings were once crowned, and from where they ruled. 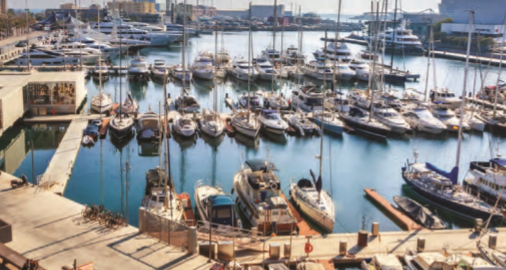 Although most of the structures in the square belong to the 17th and 18th centuries, many of the original buildings in this UNESCO World Heritage Site date back to the eighth century! Made up of three loosely linked squares, the square houses old palaces, courtyards, and Hindu and Buddhist temples. The main attraction here is the Kumari House that houses Kumari – Kathmandu’s ‘living goddess’, who is evoked in a young girl every morning. As we entered the building, a row of people stood in front of three slanted windows waiting for the Kumari to come and bless them. We visited the Kumari House between 10:30-16:00 during the day, and so we couldn’t see her on the window. During these hours, the Kumari takes private lessons. There are other 12 Kumaris in Kathmandu besides the one in Basantapur Durbar Square, and together they form the Kumari worship customs. Kumari is an embodiment of Goddess Taleju, who is believed to have ruled the Kathmandu Valley from 12th till the mid-18th century. The concept of having a protector deity is prevalent in the Newar settlements, and thus the Kumari House was built, which is also one of the finest surviving examples of the Newar architecture for people who are interested in exploring traditional constructions. According to the beliefs of locals, even after earthquakes destroyed neighbouring structures in the area, the Kumari house was not affected over the years as the Kumari protects it. While exploring Itumbahal and Basantapur, we used the Bhuntu mobile application on our phone, an audiovisual guide for Kathmandu with tips of visiting little known places in the city and anecdotes of local people, with historical and cultural knowledge. The application has been developed by Sumana Shrestha, a social activist involved in the conservation of Nepali heritage – whom we met in Kathmandu through a friend. Amidst other tourist spots, Basantapur Durbar Square also bore the brunt of Kathmandu’s 2015 earthquake damage. Half a dozen temples and several towers here collapsed, and their reconstruction is still under progress. As we entered the square, we saw the flags of China and Nepal on the top of a board saying ‘China aid restoration project of nine-storeyed Basantapur tower’. What was most striking from a traveler’s perspective was not how much was lost but how much still remains. Though some landmarks were still crumbled, others came through with just a tile out of place. 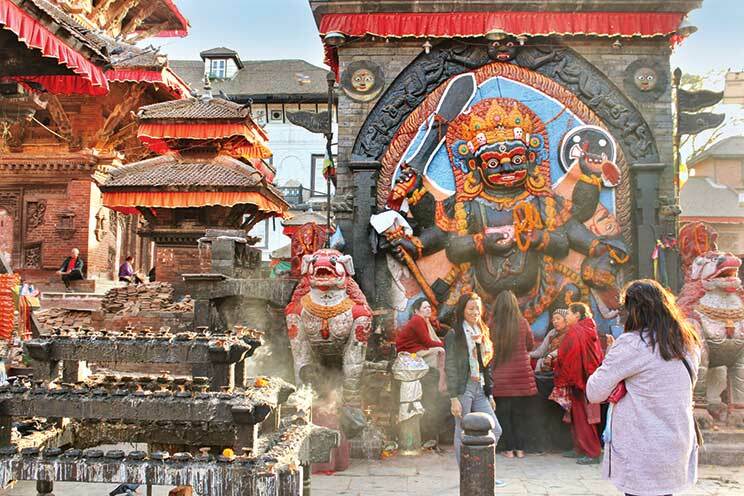 While the Chinese government is assisting for the Basantapur tower, the Japanese government is rebuilding Agam Chhen, a three-story temple inside the square that housed the family deity of Nepal’s earlier kings of the Malla dynasty. One of the world’s most important Buddhist spiritual sites is home to the birthplace of the Buddha – Lumbini, in the Rupandehi District in southern Nepal. Here, you can visit over 25 international Buddhist monasteries, study Buddhism, meditation and visit Buddha’s birthplace itself within the sacred Mayadevi Gardens. Mayadevi Temple is one of the important sites in the Lumbini Garden with many historians and archaeologists referring to it as the place of birth of Lord Buddha. Inscriptions on the Ashoka Pillar also refer the spot as his birthplace. It is said that in the Sal grove here, he took his first steps, which is now the focal point of the Lumbini Garden. You can walk around the garden or find a peaceful meditative spot. The focal point is a sandstone carving depicting the birth of the Buddha, reputedly left here by the Malla King Ripu Malla, in the 14th century. Visit monasteries built by different Buddhist countries like China, Japan, Sri Lanka, Myanmar, Germany to observe the different architecture and prayer areas, or visit the Panditarama Vipassana Center for yoga and meditation.